Nikka All Malt is true to its name and reputation — 100% malted barley and delicious. The marketing material for Nikka All Malt can be confusing because it discusses including “grain Whisky.” Not True! Nikka calls all of the spirits produced in their Coffey Stills “grain” even when it its 100% malted barley. So even though they do produce some grain Whiskies at Nikka, All Malt has none of it. What Nikka All Malt actually is, is a vatted or blended Whisky made from 100% malted barley from across their product lines. It’s like sampling all of their Single Malt products of various ages mixed together in a single dram. What does Nikka All Malt taste like? The Flavor Spiral™ shows the most common flavors that you'll taste in Nikka All Malt and gives you a chance to have a taste of it before actually tasting it. Vanilla, cream, and a light dash of cocoa. 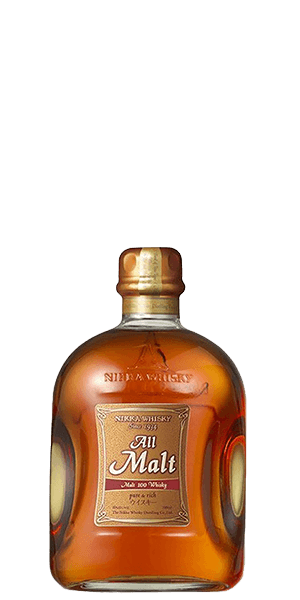 The classic Nikka “oily”, malty and rich mouth-feel with a bit of orange zest and over-ripe apple. Very smooth and enjoyable taste. I thought this was very smooth with a nice Smokey finish. I enjoyed it and I would buy it again. Thanks Flaviar! An elegant and well balanced whisky. Its full bodied texture lends well to its richness in flavor. Its smoothness and clean finish may be interpreted as simple and not complex. It definitely has very "friendly" notes and flavors up front and takes a bit of prodding to get at the rest of the flavor profile. This was one of my first Japanese whiskies, and I can clearly see the Scotch origins while embracing the ability to reinterpret it into its own unique product. I highly recommend this as your foray into the world of Japanese whiskies. And it's a great deal at this price point. Rich and very smooth. One of the better Japanese whiskeys I tasted. Nose has aromas of vanilla and dark chocolate, with a bit of spicy tang. Flavors come in with vanilla and grain backed up with a firm woodiness. Light fruit flavors gradually come in through to a nicely gentle finish with a distinct apple and pear notes. This is my first Japanese whisky and I'm finding a lot that's intriguing here- one can taste the links to Scotch whisky here but this is definitely it's own animal. It's not complex but very easy drinking with a nice smooth body and a particularly lovely finish- a solid blended whisky for a casual sip. Fine whiskey, though a little to spicy finish. Not a favorite at all. One taste and I wanted to dump it. That has only happened one or two other times in the past five years. Not bad, but my least favorite of the Japanese whiskey tasting box. A cracking Whisky I will be trying some more Japanese Whiskys. Good overall. Too sweet for me on the whole though. Good tasting flavorful whisky . Very good easy to drink, the smells reminded me of rum and raison ice cream, certainly a malty taste with hints of pear drops and vanilla. It is a very good, rich, blended Japanese whisky with a long and soft death. Really nothing special in my opinion. Has a slight bite on the front end with caramel and small smokey notes. Finish is slightly sweet and buttery. But doesn't standout to me. Mildly sweet with a little bit of smoke on the finish. Not too sweet, great slight smoke flavour. I even got a little coffee taste on the back-end. Quite good! Will definitely need to revisit. I've been wanting to try this for years. It's a new favorite! Good stuff!! Excellent smoked aftertaste!